maitreya31 wrote: Where I can buy the Anguttara Nikaya from another publisher and another translator ? I want it now . I can not wait for the bihkku Bodhi edition it seems we have to wait at least a few years. While I can understand this sentiment, and even to some degree agree with it, the wait for Bhk. Bodhi's translation will be well worth the time spent waiting once we see the final product. The time and care he puts into writing the Introductions and footnotes is well worth waiting for in order to get his insightful and experienced take on the Dhamma. It shouldn't be too much longer before it's ready for publication. In the meantime, I can highly recommend Nyanaponika's Anthology of the Anguttara, as it is filled with an excellent choice of suttas along with insightful commentary in the footnotes. Yes, it's only about one tenth the length of the full Anguttara, but even so, the choices made in sutta selection was well considered in terms of importance in being able to better understand the Dhamma. There'll be enough reading to do, as it is! Actually, I agree with putting off reading them because there may well be significant changes from the translations from 30-40 years ago and there will certainly be considerably more detailed references to ancient and modern commentary and analysis, and cross-referencing to other suttas. There are significant differences even between editions of the MN (as I found out when involved in a sutta study group (I think we had all three editions between us). I think the sutta discussed in this thread http://dhammawheel.com/viewtopic.php?f=29&t=7726" onclick="window.open(this.href);return false; is a case where the later edition has changed the paragraph under discussion, and I recall that in some suttas we discussed the English word used for some Pali term or other had changed. ..... and if that's the way the dice rolls I'll be happy to have waited too. For this edition, the revised translations by Venerable Bodhi as given in the Numerical Discourses of the Buddha have been used with his kind permission. PS Don't forget Thanissaro Bhikkhu's translations on Access to Insight! I like them because I can post them for free distribution without having to ask for copyright permission. Last edited by dhammapal on Fri Mar 18, 2011 8:20 am, edited 1 time in total. Doesn't that refer to the revised version issued in 1980? I have the original Wheel 155 published and printed in 1981 and no mention of Bhikkhu Bodhi just Nyanaponika Thera. Wikipedia says that Bhikkhu Bodhi's anthology was in 2000. Anyone know any new info on the release date? I finished the samyutta not too long ago by Bhikkhu Bodhi and I can't wait to read this one aswell. Wisdom Publications has received Bhikkhu Bodhi's new translation of the Anguttara Nikaya, which is currently being reviewed by our editor. Any available information or updates on this project will be announced in the Wisdom Reader e-newsletter. It doesn't have it's own news page, just found on the pages for his other books. According to the Wisdom page in the part of the Buddha Teachings , the Anguttara Nikaya is in the review process . Apparently Bhikkhu Bodhi completed the translation . JC: What else would you like people to know about you? Bhikkhu Bodhi: I should mention that I also translate Buddhist texts from Pali into English. 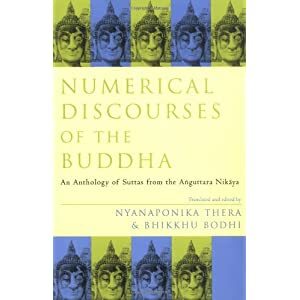 A couple of months ago I completed a translation of the Anguttara Nikaya, which has been submitted to Wisdom Publications and will be published in 2012. I donated a substantial portion of the royalties from my earlier publications to create, through Wisdom, a Nikayas Fund. The intention is to donate sets of the English translations of the four Nikayas to monasteries and libraries in the disadvantaged countries of Buddhist Asia, Eastern Europe, and elsewhere where the costs would be formidable. That is cool... it's a positive wholesome thought to bring to mind when forking over our cash to Amazon etc. - a thought that is much preferable to, and more beneficial than an unwholesome "the Dhamma should be free" whinge.